You can’t make this stuff up. Here we are waiting for these almost four weeks for the appeals judges to render a decision on the public petition signatures against Public Act 4, and this is what they come up with. The font size, THEY CLAIM, is wrong but even still, the standard is substantially compliant, which MANDATES that they allow this issue to go on the ballot — a great victory for our side — and an issue that seems strange since the call is for democracy to take place by letting the electorate vote on this critical issue. Why all of these legal wranglings? WE have to get the language for the ballot initiative set up, printed out and approved by August 8, 2012 in time for the November election. Shouldn’t we all be in support of that American tenet — “let the voters decide”? 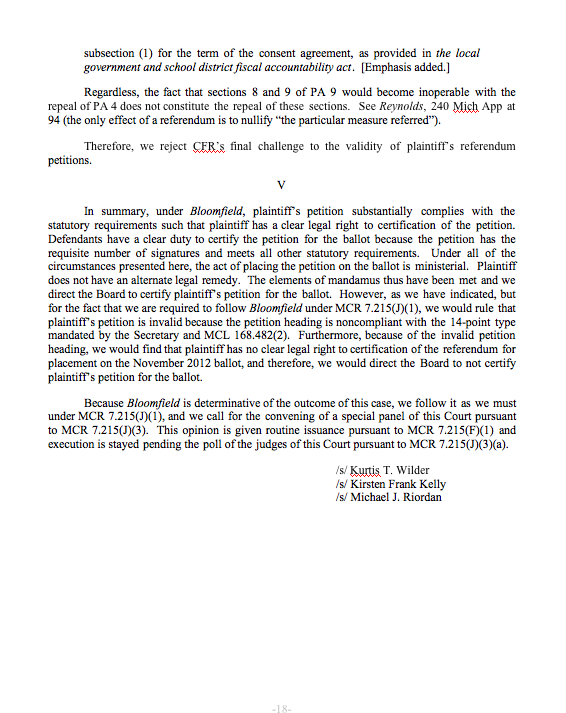 Their suggestion is that these three appeals court judges call a meeting of all 28 state appeals court judges, and from that group, select a smaller group of seven who will review the “substantially compliant” decision rendered years ago, overturn it, and follow thru with overturning every other similar supportive decision rendered from that date forward until they arrive at THIS issue as a basis to overturn our efforts. WOW!!! This damned democracy is too freaking dangerous and must be done away with. Gov. Snyder has now become the law of the land, and we must knuckle-under when he wants to overthrow elections then hand-pick managers who do his bidding. No more back talk! No further grievances will be filed. Abandon any further uppity expectations that the old rule of law is to be followed. Things have changed, so you should all get with the program and quickly! Colleagues, I urge you to all stop these foolish roadblocks and attempts to circumvent the will of our new masters who believe themselves to know more than we do. The “spirit of democracy” that we grew up with is an old adage, stale, decayed, unproductive, and not what the country needs anymore. WE need to stand behind the “new world order,” allow our rights as ordinary citizens to be trampled and prove our collective love of country by bearing these assaults in silence and with total compliance. This damned democracy was not everyone’s rule. We were taught this concept when we came to this country. Some arrived on the top or in the bottom of the boat, and others greeted and welcomed these travelers when they arrived on shores already populated by natives. We listened to it, sounded like it could work, and we bought into the “hype” that we are all equal in the eyes of democracy. This ruling says something else. Events of late have demonstrated a new paradigm that all have heard of, “money talks, and B-S walks.” Ever life is at stake. Every hope is in peril. Every wish is in danger. Every democratic right is in the line of fire and there are fingers on triggers at the ready. The future of mankind is in the balance. Each of us has to now decide in the face of such a shocking ruling by the Appeals Court judges what direction does the country now need to go if we are to protect the State and the Nation. If the “ballot box” is no longer the pathway to social justice, and the court system is no longer the bus we can ride to take us there, then what mechanism do we use to secure the lives and freedoms of our children? You either stand down in silence, or you RESIST, ORGANIZE, and WIN. You get what you organize to take. 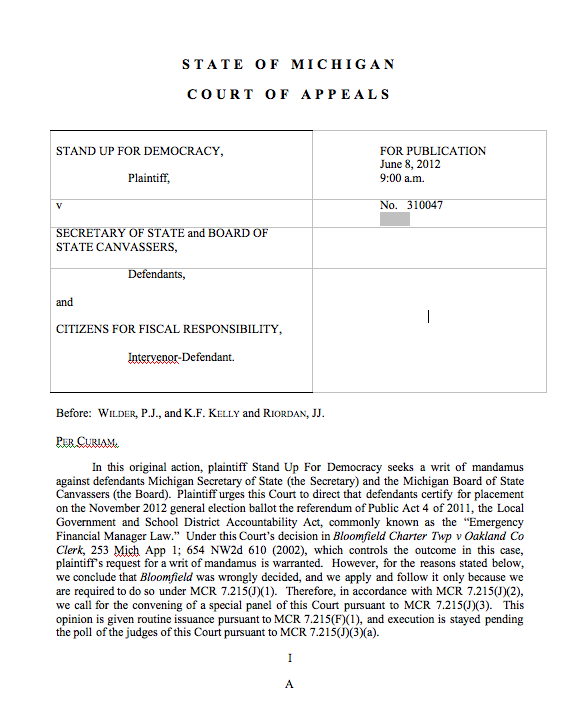 Be the first to comment on "Democracy Under Attack Through Appeals Court"